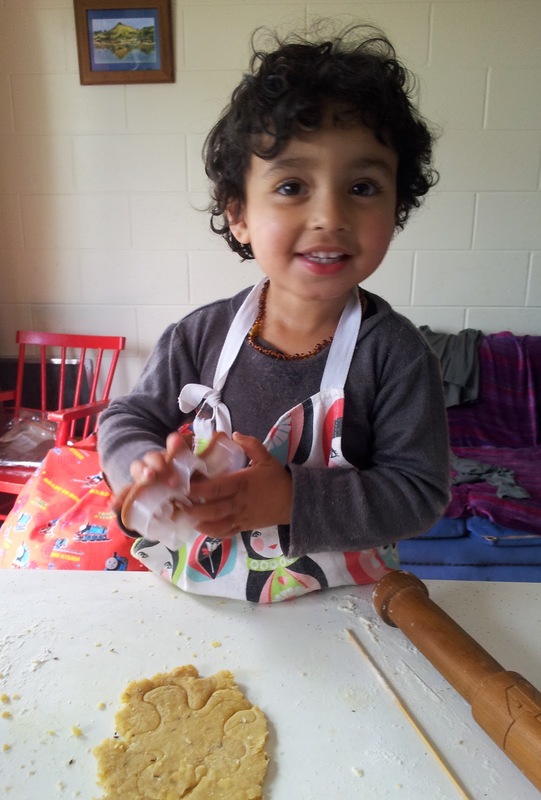 I am on "Nana Jean" duty in Auckland with 2 year old Beau while our daughter Tansy is acting in a play. As we live at the other end of the country, it has taken time for Beau to get used to me, but I think I have cracked it - he likes interesting food! "Simple ornamentation. They want to look good. Just like you and I. They are chemically protected so don't need camouflage", txt Ruud. 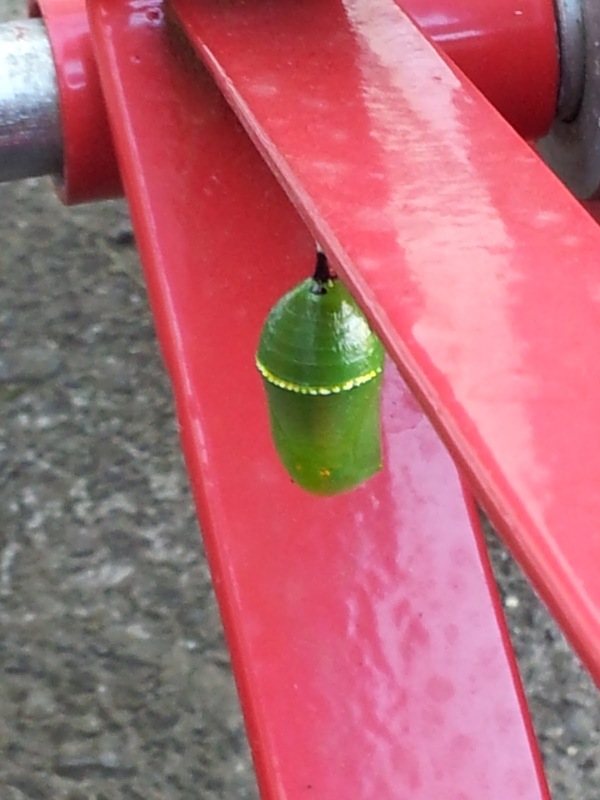 Ah that's why the caterpillar chose a red sack barrow to hang out on rather than a plant. Two of the three pupae don't have names, but one does. A week ago one caterpillar caught Beau's eye when it left the swan plant for the next stage of its life. Tansy recorded the moment on her phone. You might like to see the whole process in this excellent time lapse video made by Duncan Scott for the Chicago Nature Museum. It's only four minutes long and shows the complete life cycle of the Monarch. I was inspired to create a salad for Beau that night with a caterpillar theme. 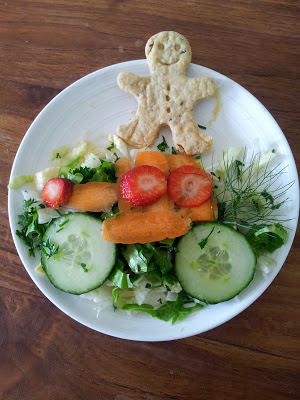 My only mistake was calling it "Ken the Caterpillar salad"... at first he wouldn't eat Ken. 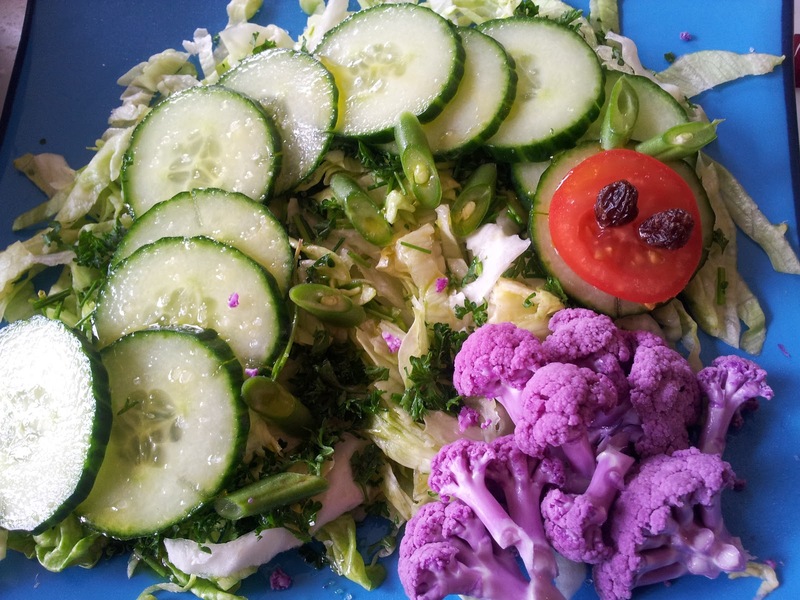 It's a good way of making a green salad come to life for kids and perhaps may convince young non-salad eaters to give it a try. Next the fun part - to create the caterpillar using thin slices of cucumber, a tomato slice and for eyes a couple of raisins. For the legs green beans. Alternatively you could use slices of coloured peppers or cut small pieces of dried seaweed for the legs. To make it easier to handle, sit the dough for half an hour in a cool place before rolling. If you haven't the time just roll out immediately. Cut into shapes of your choice. Place on baking paper, or a greased tray in a preheated oven at 180C for 20-25 minutes or until light brown and crisp. 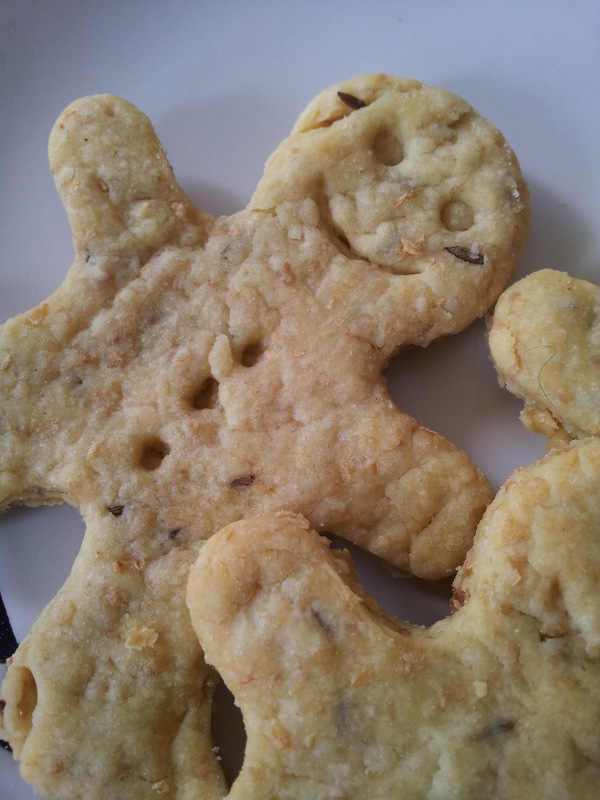 I got the recipe from the blog Little Food Junction where there are lots of ideas for making exciting snack food for kids. Unlike many other blogs about kids food, the ideas don't tend to be loaded with sugar. If you click on this link you will be taken to a post I thought most fitting -"The Hungry Caterpillar". 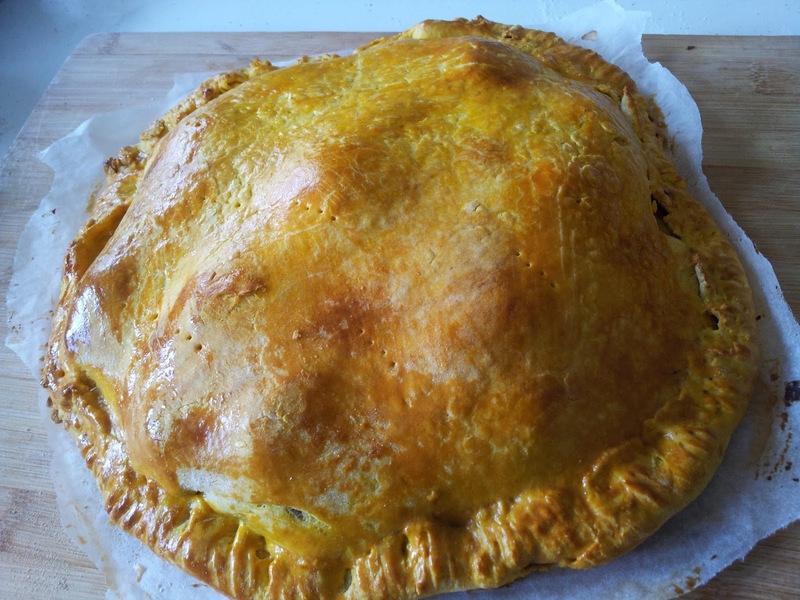 For the recipe for the pie go to my posting "An Unusual Vegetable Pie Turns Carnivore"
I have also tried this pastry using a gluten free option. I used spelt flour. Spelt can be a little dry in texture but with the mashed vegetables this wasn't such a problem. 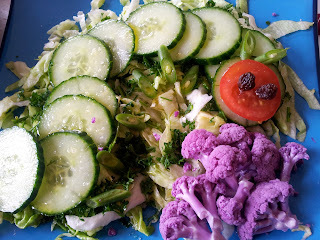 Salad Series I - the salad can be the star!